in our online store you can place order as a guest or as a registered user. We recommend the latest option, since then you can also participate in our auctions. To do this, click the “Sign In” button and in the popup window, click “Create Account”. Then fill in the required fields and click on the “Send” button. An email confirming your registration will be sent to the email address used for your registration and after that you can start ordering the products. After selecting the product(s) you are interested in, click on the “Add to Cart” button. Then you can continue browsing the products or start ordering. Before confirming your order, make sure your contact and shipping details are correct. We recommend fill contact and shipping details under “My Account” because this is an one-time operation and takes only few minutes. You don’t have to repeat this in the future, since all fields are pre-filled next time. It is also important to choose the appropriate mode of transport – SmartPost, DPD or “I will pickup goods myself”. Our online store generates an invoice for you, which you can instantly pay in your Internet bank (using bank links on the website) or later in your bank office. The final amount reflected on the invoice includes VAT. According to the chosen delivery method, the ordered products reach you within 2-3 business days after the payment is received into the bank account of Electronics OÜ. The DPD courier agrees the exact delivery time of the shipment with the recipient of the package in advance. For smaller products you can choose SmartPost service and you will receive a message to your phone about the arrival of the package. The consumer who purchased the goods is entitled to return the goods within 14 days from the date of receiving the goods and receive the money paid for the goods (except for the delivery fee, if the courier service was chosen as the delivery method). The returned goods must be in the same condition and in the package as it was when the goods were received. Please return the purchase documents for the returned goods (+ invoice). The offer Liisi and LHV lease service to our customers. 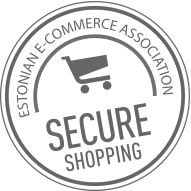 If you want to buy products with lease service, please contact our store Sõpruse 25, Tallinn. We will assist you in completing your application and the decision will arrive in minutes!